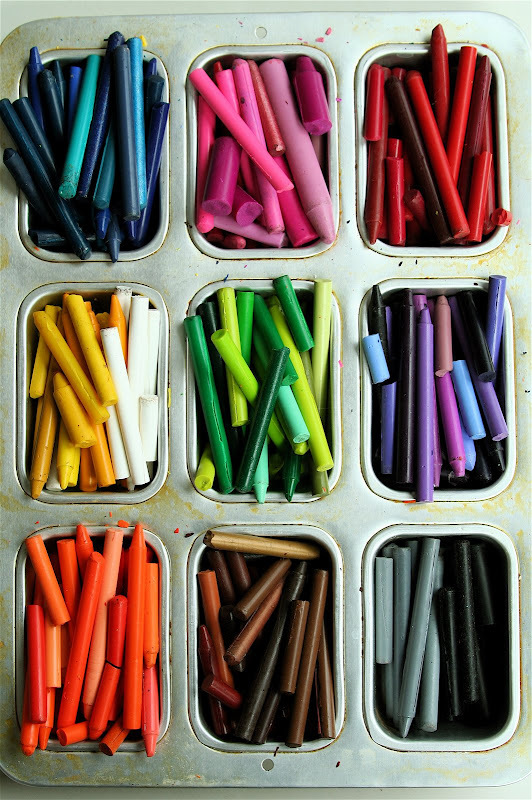 I just love this idea of storing and sorting your crayons by color! My kids are always ripping off the papers too. This mini loaf pan is so cute too! One of my favorite things to do is to use something for some purpose other that what it was invented for. Like in my living room on my coffee table I have a vintage baking pan I use as a tray for books and magazines. wow that is cool! i juar have to say that I LOVE your blog..it is so entertaining and fun. i am glad we have playgroup! What a fun image!! I love how coordinated and organized they are... the question is... would they stay that way?? ;) I bet it's a great way for teaching colors! And thank you so much for your sweet complements about my artwork! You're so sweet! I love the bright colors! This picture makes me want to be in elementary school again... I loved coloring! I just got so inspired by this that I jumped up and divided our baby wipe tub full of crayons into my old mini loaf pan. It only had four loafs, so it doesn't look as good as yours, but I think it's an improvement on what I had.